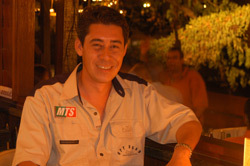 Over the years many of our regular guests have become such familiar faces, that we would like to place them “In the spotlight”. In this special feature they tell just what it is that brings them back to The Riverside…again and again..
Gong, tell me about yourself, what do you do in life? I have a fashion business “Nature & Life”, designing, manufacturing and exporting asian fusion clothing. I take inspiration in modern and traditional fashion styles from India, China and Thailand, some tribal, combining them into a unique blend of attires with a distinctly asian touch. Most of my creations are exported to Japan, Singapore, Hong Kong, South Korea, Europe and the US but can also be purchased at my shop. 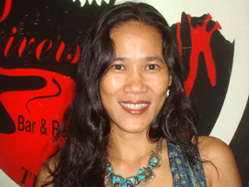 At age 17, when selling cloths at the Night Bazaar, I dreamed of having my own business in the fashion world. It started out with designing jewelry, then clothing. By the time I was 19 I had a small business up and running, employing 10 people. By then I was pretty much a regular customer at The Riverside already. I remember the days, 24 years ago, when me and my fellow students would share a bottle of Thai Whisky between seven of us and listen to The Riverside band playing Eagles and Scorpions. There wasn’t enough money for ordering food then. What do you like about The Riverside? I enjoy the relaxed, hassle free atmosphere. No dress code, great music and people from all walks of life. Sometimes I bump into old friends I haven’t seen in years and lost touch, they too keep coming back. I also take my customers here cause I know they will enjoy the good food and atmosphere. Any words on The Riverside by the waterfall? Frankly, I like it better than the former “Thai side”. 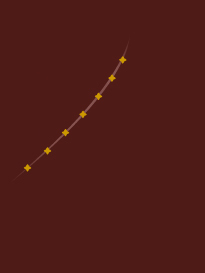 There are more options now, more varieties of atmospheres to choose from depending on occasion and mood. And the original side by the river rocks as always when I’m in the mood for dancing. I live near Paris, France but was actually born and grew up in La Reunion, a tropical island in the Indian Ocean. ...and what do you do for a living? I’m in my 25th year with Air France, working in the Human Resources department where I am responsible for Training Programs. Chiang Mai seems to be one of your favorite destinations? Over the years I have come to Chiang Mai and its surroundings more than 50 times, usually 3 to 4 times per year, thanks to my employment with the airline. A lot here reminds me of my youth in La Reunion, the good climate, the tropical fruits, the smells, the spicy cuisine, I feel at home. Why do you like coming to The Riverside? I know the staff, they know me and I always get a very warm welcome and service, something I appreciate to the point I visit The Riverside every day while in town, sometimes even twice a day. I love the food here, the atmosphere and the bands, especially when they play Pink Floyd, U2 and other tunes from the ‘80s. What’s your favorite dish at our restaurant? That would be the “Kao Soi”, a local egg noodle curry dish also the “Gang Hung Lae”, a Burmese pork curry. 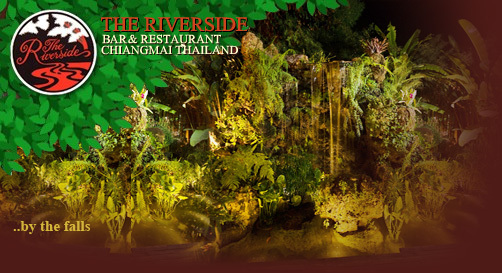 You can be seen on either side of the restaurant, by the river or by the waterfall. It usually depends on my mood, I love the river views but then I also like to be next to the waterfall in the more quiet areas. 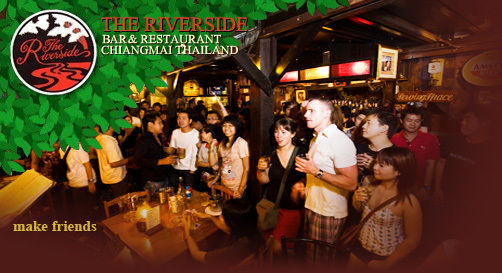 That’s the great thing about The Riverside, there are many different atmospheres to chose from. 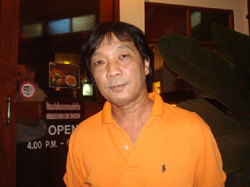 Pi Yai is working for the Electricity Authority of Thailand as a Network Coordinator and has been a friend of The Riverside forever. You can usually find him at the bar of The Riverside by The Waterfall, listening to our bands. 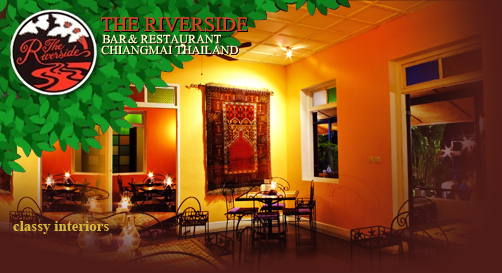 Pi Yai, can you still remember the first time you have come to The Riverside? Yes I do, it was in the times when there was only the “Farang” side by the river before the first extension, so more than 20 years ago. What made you come back to The Riverside through all those years? It really is a combination of different factors such as the tasty food, the friendly staff, the great music, the owners who always stop by for a little chat, the whole atmosphere. 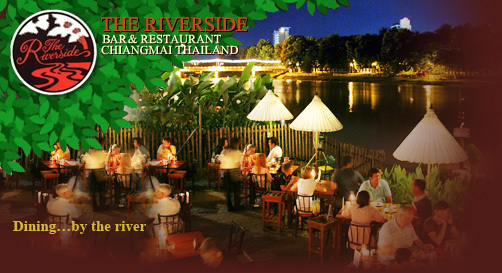 Sometimes my work takes me to other provinces but whenever I’m back in Chiang Mai, The Riverside is my place to go to. For the time being I’m based in Chiang Mai, so I can come on a more regular basis. What food items are your favorites? I usually order Spicy Salads, like Spicy Beef Salad or Sour Minced Pork Salad. I also like your marinated chicken wrapped in Pandanus leaf. 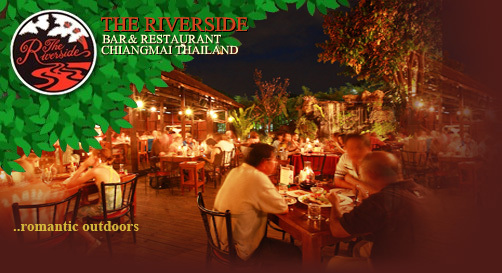 I think the food at The Riverside is nice and tasty…..my favorites definitely being the Spicy Salads. What do you think of our music program? It covers a great range and the bands are really outstanding. I like them all equally; I couldn’t really pick a favorite. What do you think about our new extension? When I first heard the news that a part of The Riverside would have to move across the street I was quite skeptical. How would it be like? Can they recreate the special feel, would it work? But when I first put foot in The Riverside by The Waterfall I was amazed how great it had come out. It definitely exceeded my expectations. I particularly like how you managed to blend the different atmospheres into a harmonious unity. 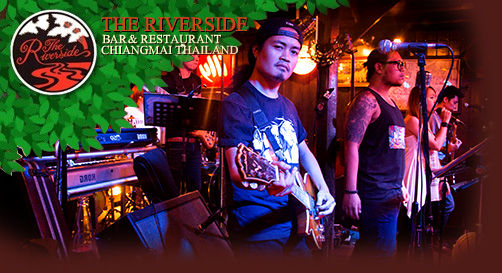 For me The Riverside has always been a great place for music and fun with a very special vibe. Tyler, what brings you to Thailand? Long story….I first came to Thailand when I was 15 and spent five years as a Thai Boxer, mainly in Bangkok. 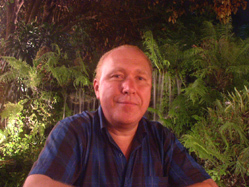 After five years in the British Army I moved back to Thailand making a home here in Chiang Mai. I am a body guard. You’ve been coming to The Riverside for quite a while, haven’t you? That’s right. For the last eight years, but since the opening of the new Riverside by the waterfall (just across the street) I have been a very regular guest, like 2-3 times a week. Why’s that? What do you like about our new extension? Even though it definitely has got The Riverside feel, it is more spacious than the original place by the river, I like this extra bit of personal space. And of course I like the waterfalls. It’s this family feel, the staff know me and take good care of me. I like the friendly atmosphere and I think the bands are absolutely fantastic. Just love them. Great food and the prices are very reasonable. Just one last question. 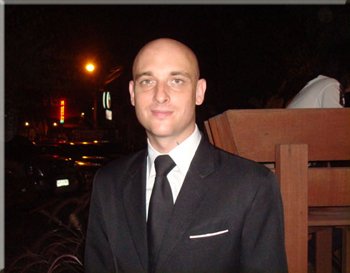 You can often be seen wearing a suit when going out. …. (laughs)…yes, it’s my style. I feel appearance is important and I am used to wear a suit on the job. Fon, what do you do in life? Chiang Mai is famous for its local handicrafts. You can find manufacturers of silver ware, paper products, silk, resin products, jewellery, lacquer ware, wooden furniture, pottery , terracotta, decorative items and many more. I track and provide such products for my international clientele according to their needs and requirements and assist with the export processes. Can you remember your first night out at The Riverside? As a high school student I often passed by The Riverside and I always knew that as soon as I would earn my own money, this would be my place to hang out. Then one night, by now I was studying art at Chiang Mai University, the senior students of our faculty took us freshies out…….to The Riverside. That was 13 years ago (Fon stops and reflects…wow, time flies), and I have kept coming back ever since. Actually some of my painitings can be seen on the walls of The Riverside. What brings you back to the Riverside over and over again? It is this very special atmosphere and my very personal history with the place. When ever I have one of my export customers over from overseas, I will take her/him to The Riverside for a night out by the river. Andre, what do you do in life? For how long have been coming to The Riverside? From the very beginning more than 20 years ago, must have been day 2 or so. Over the years I have become very attached, almost addicted (laughs) to The Riverside. I have seen it grow and develop from a small place to what it is today. It’s become a habit for my wife and myself to come over for dinner after work, to relax and discuss things. We like the taste of the food and the very special atmosphere, the hospitality and the warm feeling of being recognized and welcomed by the staff. 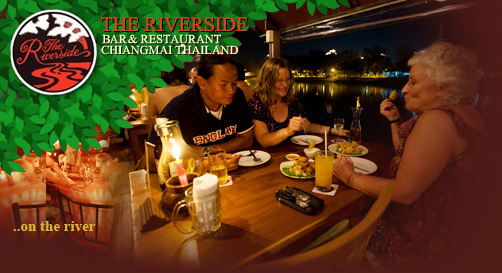 I also send my customers to The Riverside and always get great feed back from them.